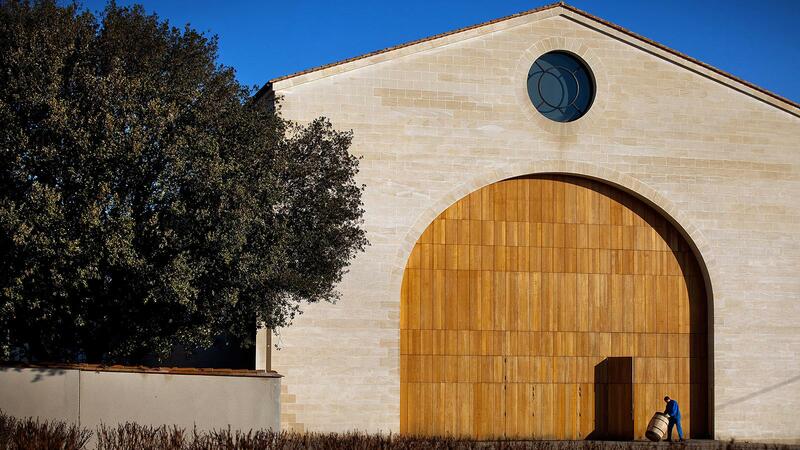 It's the business of making stylish wines as usual at Château Mouton-Rothschild. Continuing in Pauillac, I stopped in at first-growth Château Mouton-Rothschild, where the always proper and direct Philippe Dhalluin has locked down another solid year. "It was an early vintage. The weather was particularly good in spring, with early budbreak, and the cycle started from there," says Dhalluin. "Obviously the big frost in April was an issue for some, but with our location we were not affected at Mouton, nor Clerc Milon. Only one plot in d'Armailhac. The plots for Aile d'Argent were hit, as the whites are not planted on the warmest terroir." "June was a bit wet and then summer was dry, sunny, but no excess of heat," Dhalluin continues. "The maturity came slowly but surely. We would have loved to get a bit more water, because overall the year was dry, going back to the previous winter. Plus '16 before was also dry. So the result was many smaller berries with thicker skins and a little slow down in maturity. But in the end, it was really an easy season and so there is no excuse in the winemaking." "We started harvesting Merlot at d'Armailhac on Sept. 6 and at Mouton Sept. 7. Then rain Sept. 8 through 11 so we had to stop," he says. "It was the Merlot, with the exception of those on top, top terroir, that was diluted a bit. But there is a big difference between the Merlot and Cabernet. Because from Sept. 15 through the end of September was perfect and we finished picking everything by Sept. 29, uncommon, but caused by the earlier cycle." "My concern with '17 was to make a wine a bit too straight," Dhalluin says. "Because of the drought, the chance to get grainy tannins was there. But I think we have a good balance with the fruit to match the tannins." "If you want to avoid dry tannins, you have to pay attention to the maturity," he says. "It was a bit like '95 and '11. You have to wait long enough, without getting surmaturité (overripe). And so we do the délestage (racking) and remontage (pump-over) early in the vinification process, which extracts more color than tannins. Then as we taste the vats we can slow down or stop the délestage and remontage to avoid overextraction. At that point with just maceration you can draw out the remaining extraction slowly and decide when to stop." The 2017 d'Armailhac is fresh, pure and racy, with a lovely beam of cassis and bitter cherry fruit and nice piercing hint of chalky minerality through the finish. The 2017 Clerc Milon Pastourelle (second wine, made since 2009) is bright, fresh and forward, with lovely cherry and red currant fruit gilded with light floral and mineral hints. The 2017 Clerc Milon is pure and racy from the start, with a lovely mix of cassis and raspberry puree stitched with a lilac note. A fine minerality flows through the finish, with the fruit draped gently over it. The 2017 Le Petit Mouton-Rothschild (second wine, 21 percent of the crop) offers a pure cassis aroma and flavor that flows forth, with alluring singed apple wood, warm cherry compote and light floral nuances weaving around as well. Its succulent finish has an alluring feel. The 2017 Mouton-Rothschild grand vin is succulent and driven at the same time, with dark, winey cassis and plum fruit that drives through, picking up light apple wood, anise and floral notes. It's remarkably supple and charming even at this nascent stage, all without sacrificing length or depth, as there is well-integrated grip. This is a very stylish Mouton in the making. The 2017 Aile d'Argent comes from a higher percentage of Sémillon than usual, as two out of five plots (with a majority of Sauvignon Blanc) were lost to frost. It's enticing, with starfruit, kiwi and green pear flavors laced prominently with honeysuckle and verbena. There's a good juicy edge through the finish, with a nice full feel.